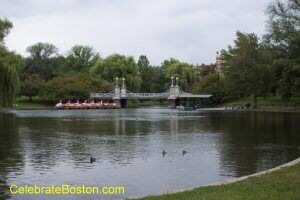 The Boston Public Garden is a beautiful park located near the city center. The garden is surrounded by Charles, Boylston, Arlington, and Beacon Streets. The nearest MBTA subway station is Arlington on the Green Line. The Public Garden contains over 24 acres, and is designed in the shape of a parallelogram. In 1862, the present iron fence was built, and the enclosure graded, filled, and laid out as a garden. During spring, summer, and autumn the garden has beautiful beds of flowers and lush green lawns. There are several notable statues and fountains. In the center of the garden is an artificial lake, sometimes locally referred to as the lagoon. An iron suspension bridge spans the pond, connecting the main footpath from the Charles Street entrance to Arlington Street on the opposite side. With this path, Boston Common and the Public Garden are practically connected, and by way of the green center of Commonwealth Avenue, unite the Back Bay with the downtown area in one long trail. The chief work of art in the garden is Thomas Ball’s equestrian statue of George Washington; other statues include that of Edward Everett and Charles Sumner, the Ether Monument, and the children's favorite Make Way for Ducklings. The famous Swan Boats cruise the lagoon during summertime. Cheers Beacon Hill is also right across Beacon Street from the garden. The most recent addition to the Public Garden, and a popular attraction, are the Make Way For Duckling Statues by Nancy Schon, inspired by the 1941 illustrated children's book by Robert McCloskey. Substantial appropriations are dispersed by the City of Boston for the care and maintenance of this garden, with its beautifully planted flower beds, fine clumps of shrubbery, and groups of splendid old trees that offer refreshing shade in nearly all parts of the park. Abundant seats are placed in the pleasantest parts of the garden, and it is a popular retreat of the people. The Public Garden was originally part of Boston Common, and was known as the "round marsh," or the "marsh at the bottom of the Common." After a great fire in 1794, at Pearl and Atkinson (now Congress) streets, in which the rope-walks (long narrow wooden sheds used to weave rope and/or pedestrian paths) were burned, the Town of Boston, in an unusual act of generosity, gave these flats to the owners of the burned rope-walks, on which to construct new buildings. In 1810, new rope-walks built in the flats had in turn burned; and then their proprietors decided not to rebuild, but to cut up the territory into building lots, and sell it for business and dwelling purposes. The property's value had been greatly enhanced by the opening of Charles Street in 1804; and it was to be further improved by the Mill-dam Project (extension of Beacon Street) then under way, by which the marshes and flats would be converted into dry lands. Many citizens strongly objected to the rope-makers' scheme, and in 1824, the first year of the Josiah Quincy's administration as mayor, the property, which 30 years earlier had been given away, was reacquired by the city by the payment of $55,000. With ownership having passed to the city, a proposition to sell it for building purposes was again proposed, this time in the city council. The question was referred to the people, and in December of 1824, happily, the citizens by a decisive vote refused to give the city council authority to sell. Support for building on this territory continued for several years, with more or less fervor. At one time it was proposed that the city buildings be established here, and it was planned that the City Hall should be placed on Arlington Street. In 1850, the question was settled finally by an Act of the Legislature and vote of the city, when the land was dedicated forever to the use of the people as a Public Garden, and were enclosed within the present boundaries. The idea of making a public garden here was conceived years before. In 1837, Horace Gray and others petitioned for the use of the land for such a purpose, and it was granted conditionally. In 1830 these gentlemen were incorporated as the "Proprietors of the Botanic Garden in Boston," and a conservatory for plants and birds was fitted up, which flourished for some time until its destruction by fire. Walking Directions: Exit the station, the park is visible from any of the subway entrances at street level. Most people walk two blocks down Arlington Street to the Commonwealth Avenue gate, and enter the garden near the large equestrian statue of George Washington.